Thanks to Mike (ghostop14) for submitting another interesting article this time about his work with spectral fusion on the WiFi and Bluetooth bands. 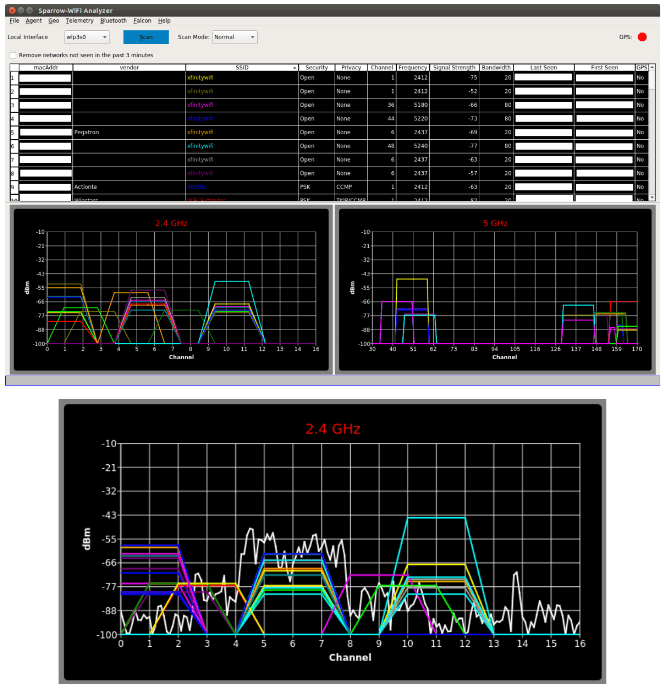 In the article Mike describes his new Sparrow-WiFi tool, which is a tool that allows you to visualize the WiFi and Bluetooth signal spaces all in one spectral display. The hardware consists of a WiFi and Bluetooth dongle as well as optionally an SDR like the HackRF. The software displays all data simultaneously on the same display, so you can easily tell if there is some channel clashes occurring, or if there is some other source of interference. In Addition Sparrow-WiFi also works remotely and even with a Raspberry Pi mounted on a drone. Thinking about the 2.4 and 5 GHz bands, my biggest issues with traditional wifi tools were always that apps such as inSSIDer which are great on the Windows side didn’t have a nice polished Linux GUI equivalent so I’d have to run a Windows system or virtual machine to visualize the signal space. On the flip side, some of the great Linux-only capabilities didn’t have a nice polished integrated UI and I’d have a lot of textual data, some of which the Windows tools didn’t provide, but it was harder to visualize. Then there’s the fact that wifi tools can’t “see” Bluetooth (and vice versa), and SDR historically didn’t have enough instantaneous bandwidth to show the whole 2.4 GHz or 5 GHz spectrum at one time. And, did I mention the tools don’t integrate or talk to each other so I can’t get a “single pane of glass” perspective of all the different ways to look at the same RF space simultaneously? It would be great if I could get one single view of the most common protocols and see the actual spectrum all in one place at the same time. Now enter the era of the Internet-of-Things, new SDR receivers, and even drones and my old wifi tools seem to have been left a bit behind. Why do I say that? I can’t “see” all of the chatter from wireless networks, Bluetooth, ZigBee, NEST devices, remotes, etc. scattered all over my wireless bands in one view. Sure, I can run 3 or 4 tools independently to find the signals and try to see what they are, but it becomes tough to get a single integrated perspective. Especially when I can’t see my RF spectrum overlaid on top of the wifi SSID’s and Bluetooth advertisements to sort out what may be related to a a signal I know about and what may be something else. Ultimately, it means that I can’t clearly explain why I have poor wifi connections in one area versus another even though I may not have overlapping channels (I know, use 5 GHz and sparrow-wifi supports that too). The reason for this is simple; current tools don’t have true spectral awareness based on the most common possibilities in one integrated solution. Now, let’s ask even harder questions. What if I want to step up my wifi “wardriving” and start “warflying”? Or, what if I need a mobile platform that can be sent into an area on a rover? 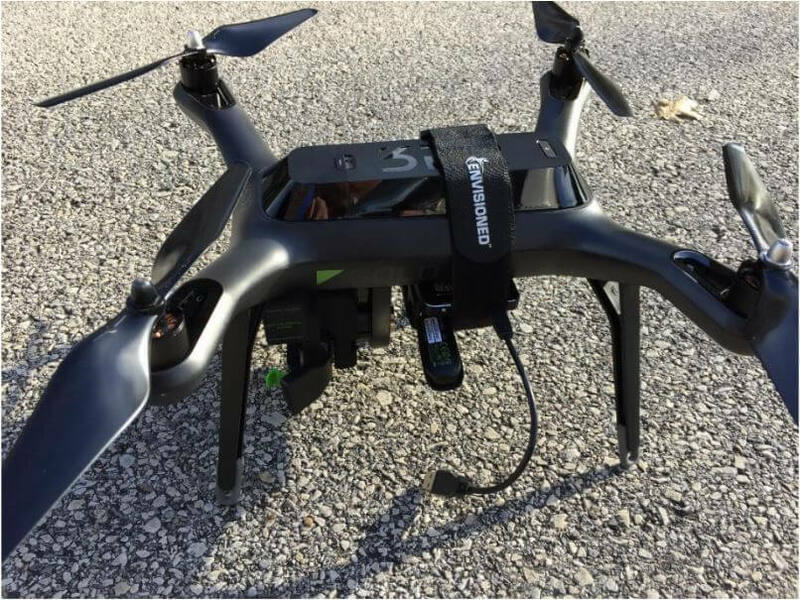 Can I bring the same spectral awareness in a small enough platform to fly for example as an under-350-gram payload complete with power, wifi, spectral scans, and even pull GPS for anything we see? And, can I interact with it remotely for real-time visibility or have it work autonomously? Okay, now you’re just asking a lot. These were all goals of a new tool I just released called “Sparrow-wifi” which is now available on GitHub (https://github.com/ghostop14/sparrow-wifi.git). Sparrow-wifi has been purpose-built from the ground up to be the next generation 2.4 GHz and 5 GHz spectral awareness and visualization tool. At its most basic, it provides a more comprehensive GUI-based replacement for tools like inSSIDer and linssid and runs specifically on Linux. In its most comprehensive use cases, Sparrow-wifi integrates wifi, software- defined radio (HackRF), advanced Bluetooth tools (traditional and Ubertooth), GPS via gpsd, and drone/rover operations using a lightweight remote agent and GPS using the Mavlink protocol in one solution. Sparrow-Wifi Spectral Fusion. Wifi & Bluetooth dongle data + Live spectrum from a HackRF. A full list of the possible scenarios that Sparrow-WiFi was designed for is pasted bleow. Wifi source hunt - Switch from normal to hunt mode to get multiple samples per second and use the telemetry windows to track a wifi source. 2.4 GHz and 5 GHz spectrum view - Overlay spectrums from Ubertooth (2.4 GHz) or HackRF (2.4 GHz and 5 GHz) in real time on top of the wifi spectrum (invaluable in poor connectivity troubleshooting when overlapping wifi doesn't seem to be the cause). Bluetooth identification - LE advertisement listening with standard Bluetooth, full promiscuous mode in LE and classic Bluetooth with Ubertooth. Bluetooth source hunt - Track LE advertisement sources or iBeacons with the telemetry window. iBeacon advertisement - Advertise your own iBeacons. Remote operations - An agent is included that provides all of the GUI functionality via a remote agent the GUI can talk to. Drone/Rover operations - The agent can be run on systems such as a Raspberry Pi and flown on a drone (it’s made several flights on a Solo 3DR), or attached to a rover in either GUI-controlled or autonomous scan/record modes. And yes, the spectrum output works over this connection as well. Import/Export - Ability to import and export to/from CSV and JSON for easy integration and revisualization. You can also just run 'iw dev <interface> scan' and save it to a file and import that as well. Produce Google maps when GPS coordinates are available for both discovered SSID's / Bluetooth devices or to plot the wifi telemetry over time.